This past Sunday was sunny and steamy hot in Washington, D.C. 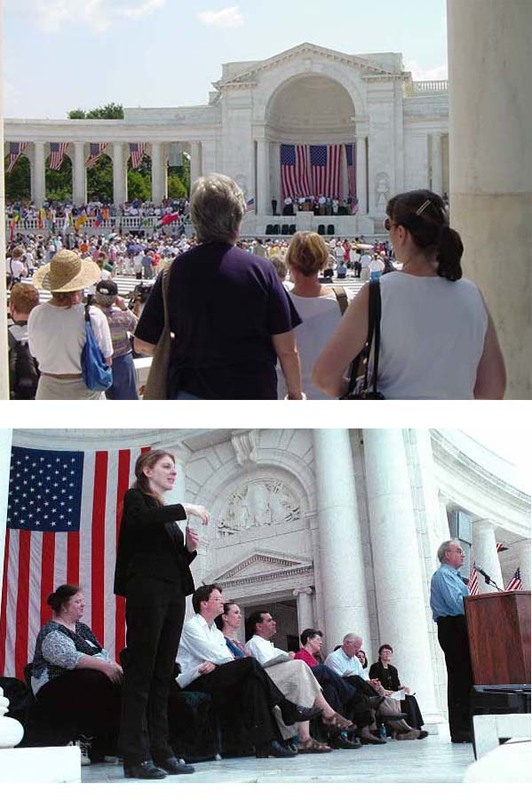 In the morning, hundreds of Returned Peace Corps Volunteers assembled beside the Lincoln Memorial. There they distributed among themselves flags from each of the countries in which the Peace Corps has served - 135 in all. They then marched, led by the flag bearers, in reverent tribute across the Potomac River to Arlington National Cemetery. At the cemetery they mounted the large hill before them, veering to the right in order to pay their respects to the agency's founder, at the grave of President John F. Kennedy. Then they continued on to the top of the hill and the amphitheater beside the Tomb of the Unknown Soldier. That's where the remembrance ceremony began. Next Congressman Christopher Shays from Connecticut (RPCV, Fiji) took the stage, striking just the right note when he asserted that "We walked their paths, rode their buses, bathed in their pools and spoke their languages ... We came home different and with a greater appreciation of our country." A few other speakers followed, Michelle Forman, the national teacher of the year (RPCV, Nepal), Harris Wofford, instrumental in the founding of the Peace Corps, later a U.S. Senator from Pennsylvania, and more recently a Clinton Administration task force member, and lastly the coordinator of the conference, Cori Welbourn Bassett (RPCV, Sri Lanka). I was honored to have the chance to depart the amphitheater carrying the flag of Swaziland. As I did, I thought about the five Swaziland PCVs who never returned from their service alive. I *believe* I met Brenda and Juanita before I left Swaziland in 1987. They would have been among the latest trainees. I heard later, when I was teaching in West Africa in '88, that they had died in an auto accident, while traveling from Johannesburg to Zimbabwe, somewhere on the road between the two. It would be interesting to hear about the personalities of these five volunteers and more about the circumstances behind their deaths. Did any of you know them? In the life you lead of peace and purpose. Jack Conrad served with the Peace Corps in Swaziland (1984-87) and in Togo (1987-89) in secondary education and rural water. He subsequently taught in Shanghai at the East China University of Science & Technology (1990-91). He is a past president of the Minnesota RPCVs and was instrumental in MN-RPCVs' successful bid for the last NPCA conference which took place in St. Paul, MN in 1999. Jack is a Senior Research Scientist with TLR's Research & Development Group in St. Paul and is currently serving as Communications Chair for the recently resuscitated "Friends of Swaziland." I will always remember the bearded, smiling Puerto Rican who came to El Salvador as a Volunteer during my service there. He was amongst the most spirited of the PCVs who lived in that country. I recall vividly speaking with him at length about the bravery of a Puerto Rican man, a friend of his, who protested the bombing of Vieques by climbing the Statue of Liberty with the flag of PR. C.A. was always good company. Here's to you and all the other PCVs who never returned. The world is a better place for your efforts. We remember. I knew Janice Hyatt. She was from Dickinson, Texas and attended Texas A&M University. Those facts only scratch the surface. She was filled with a great love of life. And what about some of us who did return but returned with a chronic illness that have also changed our lives forever. What about those of us who can not continue in our careers because of disabilities or illnesses from our overseas work? What about those of us whom Peace Corps, the US Dept. of Labor, and the Fed. Dept of Workers' Comp allow to fall through the cracks? Many of us care about our fieldsites, our villages, our lives overseas but we suffer tremendoulsy here. Can anyone here hear US? Can anyone here HELP us? Please contact Nancy if you have stories, or information. Fourdirect@aol.com (Nancy: Chile 1980-82) currently in NY. I remember Laura, as one of the happiest and most honest people I have ever known. Her nickname given to her by her friends in the village where she lived was Lindawe, which I believe meant "one who loved flowers". She was a rare flower, and when my mind remembers her smile; I feel that I am looking back at light. She would probably laugh at this, and I hope that wherever she is, she is laughing at my writing this... May we all take inspiration from such a generous and beautiful soul. Janis Hyatt joined the Peace Corp for many reasons. The one big reason was as a right of passage. She needed to prove to herself that she had value as an individual and that she was not a failure. Anyone who knew her had no doubts, but she did. Half way through her stint, she gained that final piece of self confidence that she was searching for. She realized that she could leave midway, that she had accomplished her personal goal. Of course she stayed to finish and was very content in performing the teaching role she had been assigned. Jan was hitchhiking through Botswana during one of the month long teaching breaks. She was in the back of a pickup truck with another couple whom she didn't really know that well. The truck was travelling fast in the middle of nowhere when a tire blew-out. The truck rolled, she was crushed, and died pretty quickly from internal bleeding. Maggie, the Peace Corp nurse for Swaziland at the time, escorted her body back to Dickinson Texas. She was cremated. Her friends took her ashes to a nearby beach on the Gulf Coast, lit candles, said words, and then waded out into the surf to distribute her ashes. Jan was a well balanced individual. She had a great deal of empathy for others and was frequently the shoulder that people would lean on. She was a T-shirt, overalls and barefoot kind of gal. The university paper had a picture of her standing barefoot in snow. She wore shoes only when required by law or decorum. She was adventurous. She enjoyed the unexpectedness of travel. She was joyful. She collected minature versions of everyday items to use in geology class photographs where you needed an everyday item to provide relative size. She had temp work in a drug store before leaving for Swaziland and got to play along with some kids calling about "Prince Albert in a can". She was smart and curious. She spent an afternoon in her assigned village calculating the speed of sound based upon a bouncing basketball and the gravatational effects of a falling object. The one thing she was missing was proof to herself that she was worthy. Her time in the Peace Corp allowed her to gain that self knowledge and she became a whole complete person. On May 12, 1997, my brother, Jeremiah Mack, died in a car accident in Niger. He was a Peace Corps volunteer doing masonry work, driving to a job site in a friend's village. Since then, we have struggled to make sense of his death, struggled to move forward. Recently, we learned how many other volunteers have died during their time in the Peace Corps and how many families there are like us. Please visit The Fallen Peace Corps Volunteers Memorial Project at http://www.fpcv.org. We need your help. Our mission is to create an Internet memorial in honor of all fallen volunteers, to aid friends and families in making connections with each other, and ultimately to commission a permanent, physical memorial. If you are a friend or family member of any fallen PCV, we would welcome your help- be it a story, a picture, or something different. I have spoken with Senator Dewine's staff of Ohio. Please contact his staff person in charge of Peace Corps issues. Present your proposal for memorials, memorial and your mission. Your input is vital in the process and would weigh heavily in getting memorial sites and one memorial for all volunteers who have fallen. Call 202-225-3121. Ask for Senator Dewine and then ask for Christine. He is on the foriegn operations sub committee. Last month he sent a letter to the foreign relations committee to have hearings on Peace Corps safety issues. I told her I would try and get others to write in. To all the families who have lost a love one in service, my heart goes out to you folks. These volunteers lost their lives in a noble cause and should be remembered by all of us in that way. You will always be with us. I remember a fallen volunteer, rejected by Peace Corps, the DEA, The Director, and, in the end, her family. She was accused of drugs and being psycholgically unstable. She was murdered and buried this way. I can't beleive I got to do Ames. Peace Corps became close to me this way and sent me in harms way in the hope of an apology. I survived alot, but I cannot pay this debt to a TRUE American. Government service of this person is to ALWAYS be respected by Americans. This is Memeorial Day and I can't forget what was done. I have lived what was done and think that this woman was capable. I am very sorry she was not allowed to survive what done to her and, I think, that America will ALWAYS OWE a debt to this woman for going all the way for America. I am very sorry she was taken from this earth and not allowed to live her life. I consider this person one of mine. It is now the year 2005. Matt Sherman was/is my brother. He had the most amazing spirit and the deepest of friendships with almost anyone he met. Today, almost 20 years after his death there are still many who stop by "Mom's" house to say hi and communicate that they think of Matt often. He joined the PC even though after graduation he could have had a great corporate position out of Miami of Ohio because it was his dream. Unfortunately his grandmother lost her life on "graduation night" in Honduras and that same night, the night before he was to fly home from Honduras to attend grandma's funeral he was mistaken as an intruder on the PC grounds and shot to death by PC security. We buried our grandmother and brother a day a part. Matt will forever live in our memories and hearts and even though the PC lost someone before his contributions could be felt, he will be forever considered a PCV. Matt, we love you and will never live a moment without you in our hearts. Love, Mom, John, Mary Ellen, Tom, Bob and Andy and their families.